George Inness achieved critical success in the last decades of his life when he moved away from a realistic imitation of nature in favour of a pictorialist and aestheticised vision of this theme with the aim of stimulating and inspiring the viewer’s mind and spirit. Morning was painted in this last phase of his career when Inness had retired to Montclair in New Jersey. The harmonious composition reflects his new approach: the intense green of the meadow in the foreground dotted with lightly painted cattle shades into the darker, misty area of the trees in the middle-ground, followed by the blue-grey of the horizon. The tonal transition is completed by the sky, crossed by a flock of birds. In June 1878 George Inness and his family moved into the gate-house of a large mansion in Montclair, New Jersey, where he most likely painted Morning. 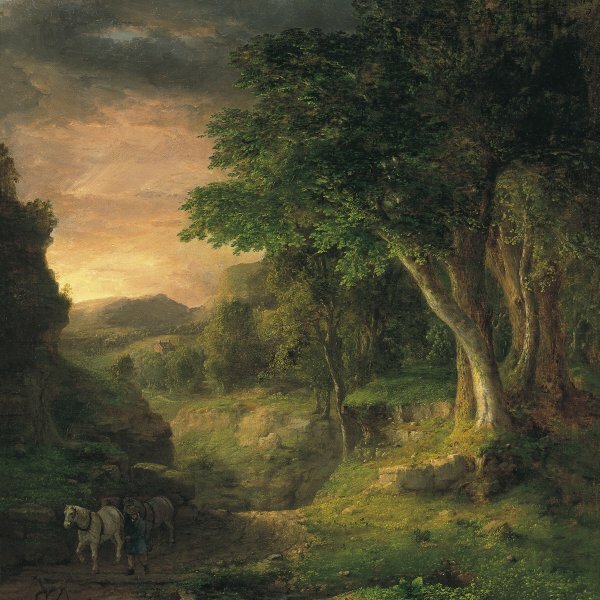 This moving landscape from the Thyssen collection belongs to his mature style of painting based, in the artist’s own words, on “the great spiritual principle[s] of unity” and “of harmony” which would “appeal to the mind through the senses.” Inness, who had an innate expressive instinct, was always convinced that the aim of art was not “to instruct, not to edify, but to awaken an emotion.” As Kathleen Pyne points out in her study on this work, like Whistler in his Nocturnes, here the artist provides a prototype for landscapes imbued with spiritual and aesthetic resonance. It was the painters of the Barbizon School, discovered during his trips to Europe in the 1850s, who provided him with the formula for suitably expressing his spiritual vision of nature. In an interview granted in 1878, he described how impressed he had been years earlier by the works of Camille Corot, Charles-François Daubigny and Théodore Rousseau, whom he considered to be “among the very best” landscape painters. To the influence of the Barbizon painters should be added his conversion in 1867, at the age of fortythree, to the mystical Christian ideas of Emanuel Swedenborg. In Morning, both the colours and the twilight are subtle and diffused, conveying sensations similar to the spiritual qualities of paradise described by the Swedish visionary. The embodiment of these ideas and the use of a composition ordered with mathematical precision cause the work to transmit a sensation of great serenity and harmony. As Michael Quick states in the catalogue raisonné of the painter’s oeuvre, Morning was acquired by Smith College directly from the painter in February 1879. 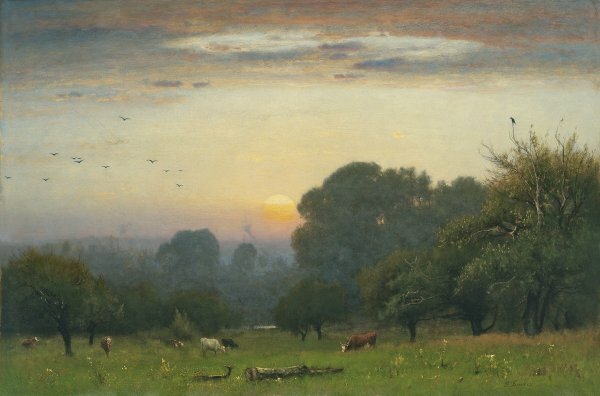 It was Inness’s first work to be incorporated into a public collection.